We only grew one tomatillo plant in our garden this summer. Based on our past success with these, I did not expect that we would harvest very many fruits. So I was dumbstruck the other day when I went to harvest. We had so many tomatillos that I had to rally the kids to hand over their sand buckets so we could fill them with fruit. We harvested over 4 gallons of tomatillos from one plant! Tomatillos are a funny fruit. The firm green fruit is encased in a papery husk that is removed before cooking. The fruit itself is sticky to the touch, though this substance washes off easily. Though they are sometimes confused with green tomatoes, tomatillos are actually from a different plant family. Tomatillos are best known for their role in green salsa. One of our favorite preparations with tomatillos is to make Grilled Tomatillo Salsa, the other is this stew. 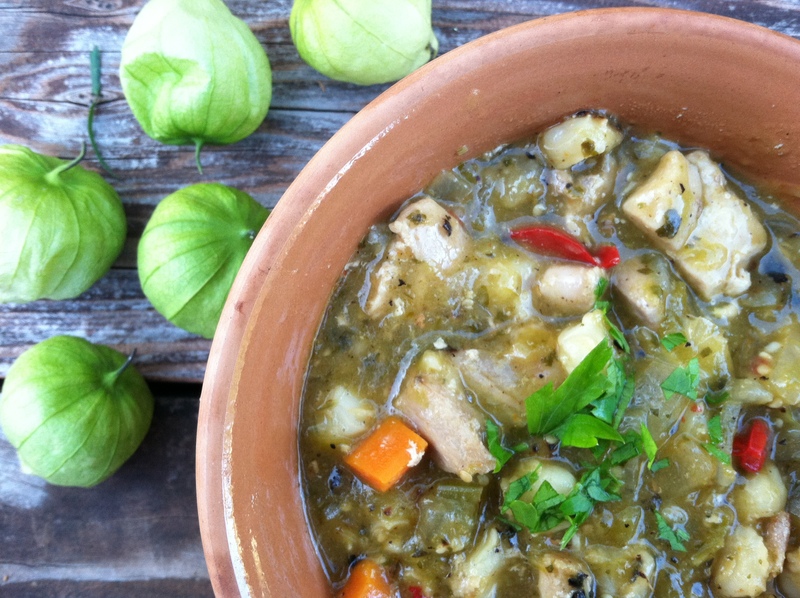 Chicken Chile Verde with Hominy is a perfect way to celebrate the tomatillo. Cook them up with peppers, onions, and cilantro ,then braise the browned chicken and hominy in this tangy sauce. The stew is warm and nourishing, yet the flavors are light from the tart tomatillos. Do not forget a squeeze of lime over the top at the last minute for a bright, acidic note. This stew can stand alone, but serve with a simple slaw and some warm tortillas for a complete meal. Heat the broiler on high. Remove the husks from the tomatillos and rinse with cool water. Spread tomatillos and peppers on a rimmed baking sheet. Once blackened on one side, flip and blacken on the other side. Watch them closely, the peppers will cook much quicker than the tomatillos. Once the peppers are done, remove from the oven and place in a covered bowl. Let sit for 10 minutes to cool and steam off their skins. Once they are cool enough to handle, slid off their skins. Remove the stem and seeds. Dice the pepper flesh. Combine the blackened tomatillos, diced peppers, cilantro, cumin, oregano, and 1 cup broth in a blender. Blend until smooth. Heat 2 teaspoons oil in a dutch oven over medium heat. 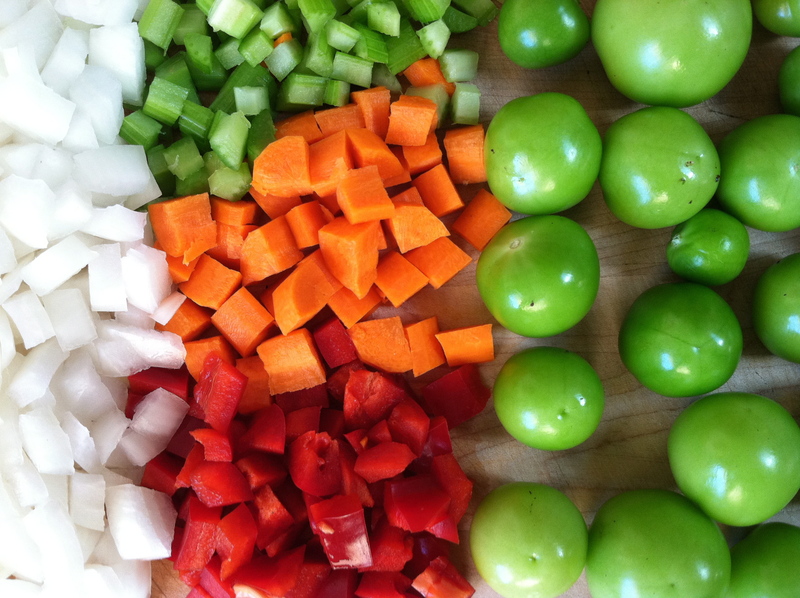 Add onion, carrot, celery, and bell pepper. Cook for 2 minutes, stirring occasionally. Stir in flour and cook for 2 additional minutes. Add garlic, cook for 30 seconds, then remove onion mixture to a bowl. Toss chunked chicken with 1/2 teaspoon salt and 1/4 teaspoon pepper. Add 2 teaspoons oil to the pan. Add half the chicken. Cook for 3 minutes or until it is browned on one side. Flip and brown on the other side. Add browned chicken to the onion mixture. Add two more teaspoons of oil to the pan. Brown the rest of the meat as you did the first batch. Ladle soup into bowls. Serve with lime wedges and a sprinkling of fresh cilantro leaves. Note: to save time or make this stew out of season, substitute 2 cups of your favorite green salsa and 1 cup of chicken broth for the tomatillo mixture. This stew is great the next day. Just reheat and serve. Yes, I grow them organically. We have not had a problem with pests. We let the chickens rid the beds of any critters before we plant. Maybe we are just lucky and those worms you speak of do not live here in Northern California. 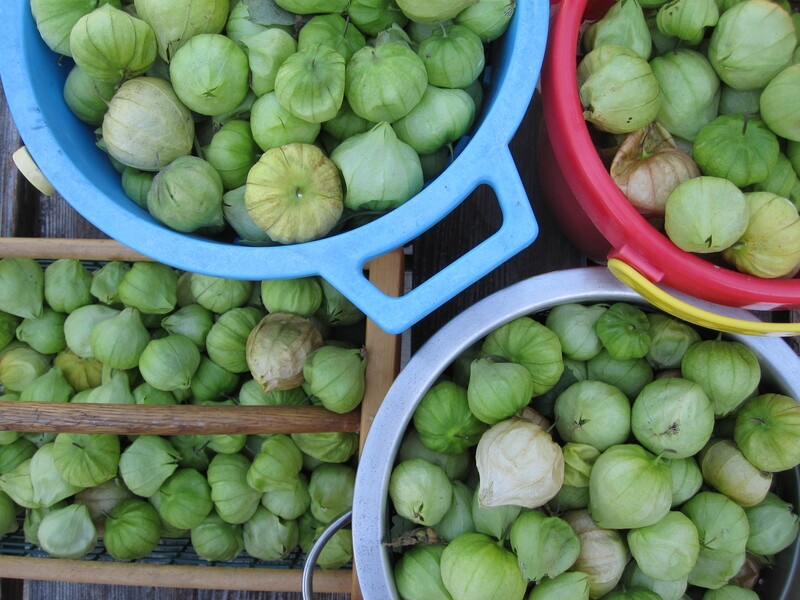 Hopefully you can still find tomatillos at the farmers’ market! What a bounty! Isn’t it funny what really takes off in the garden and what ends up going nowhere? I once had enough parsley to feed the masses. Chile Verde is one of my favorite dishes to order when we go out to eat, but I’ve never made my own. You are inspiring me to give it a try. And with this cool fall weather, your recipe is perfect! I have quite a few tomatillos from our CSA box so I’m excited to try your sauce!